Siegfried has always been my favorite character in the Soul Calibur series – a series I have played quite a bit of, mostly thanks to my coworkers, current and former, at Totally Games. While the “standard” outfit for Siegfried in Soul Calibur 4 is very crystalline, his secondary outfit is more traditional, though still very spiky. 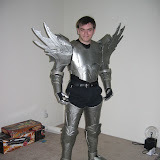 I would love to give the crystalline armor a try, but I think it would be too expensive/difficult at this point (resin is a possibility here, but I’d need some large molds to make sure the pieces come out right). 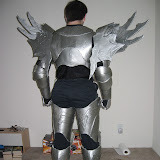 So, I’m trying a new approach to armor, using his second outfit as my testbed. At the moment, this involves using a lot of craft foam for the overall shape of the armor, with lots of layers built up and glued together. One nice feature about Soul Calibur 4 is the character editor. I’m able to use this to selectively remove at least some parts of the armor, getting a better idea what layers Siegfried is wearing this time around. Another surprising feature is the ability to destroy portions of the armor during fights. 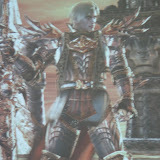 This is surprising because the armor isn’t just removed as it is in the editor – different parts get removed, allowing more details to be seen in some cases, such as with Siegfried’s shoulder, chest, and back armor. Ok after looking at the pics, you definitely need to finish this costume asap! Or maybe you already have? Either way I look forward to seeing it in person. Awesome job! Unfortunately, that costume was damaged when I moved, beyond repair. 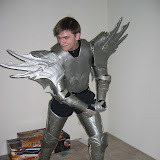 I still have the patterns to re-create the armor, though, and it’s on my list for next time I have some free time!